Colombo: Sri Lanka’s president warned that Tamil extremists were regrouping abroad to revive their demand to divide the island nation nine years after the end of its decades-long ethnic war. 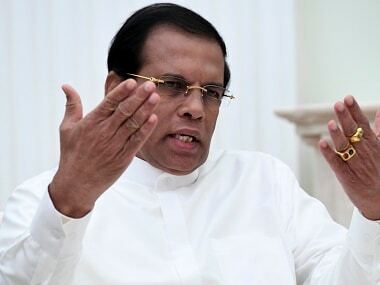 Maithripala Sirisena said government forces had failed to quash the Tamil rebels’ separatism, although they were militarily conquered by May 2009 following a no-holds-barred offensive. “We have defeated terrorism of the LTTE (Liberation Tigers of Tamil Eelam), but we have not been able to defeat their ideology,” Sirisena said. At a ceremony to mark the ninth anniversary of the end of the war, Sirisena said Tamil extremists abroad were still hoping to establish an independent homeland in Sri Lanka. “They are very active abroad. They protested when I visited London last month,” Sirisena said, referring to his participation at the Commonwealth summit. There has been no violence blamed on Tamil rebels since their top leader Velupillai Prabhakaran was shot dead on 18 May, 2009, but pro-rebel activists abroad are known to have staged frequent anti-Sri Lankan protests. Sirisena came to power in January 2015 on the back of strong support from the minority Tamil community after pledging reparations for war victims and accountability for rights abuses. International rights groups have said that at least 40,000 Tamil civilians were killed by government forces under the command of former president Mahinda Rajapakse in the final months of the war. Sirisena said there were no reliable figures for civilian casualties, but said the total number of Sri Lankans killed could be about 100,000. Official records showed that 28,708 security personnel were killed while another 40,107 were wounded, he said. Sirisena has relaxed restrictions on the former war zones in the island’s north and east, and released much of the military-occupied land back to Tamil owners. However, he is yet to deliver on a promise to grant greater political autonomy to Tamils and set up a mechanism to probe what the UN has said were credible allegations of war crimes. His latest remarks came a week after Sri Lanka’s army chief announced forming a special unit to defend itself against allegations of grave rights abuses during the final stages of the ethnic war. Army chief Lieutenant General Mahesh Senanayake has distanced the military from the previous government’s claim that no civilians died, and acknowledged there may have been individual excesses, but there have been no prosecutions. Indian Empire is big and powerful. The voters in Sri Lanka elected the present Government to defend and protect them from danger, manage the economy and needless to say eliminate corruption. The warning messages must be followed by prompt counter action and assurances that people need and are entitled to. President Maithiripala Sirisena says separatists regrouping abroad- We abroad Tamils are grouped since 1983 ! Now you know Our Hon MS why We-Tamil call you modayas ?? ?